Directions: From Morehead, follow Rt. 32 West (just over one mile past the Interstate 64 interchange) to signal light at junction with Rt. 377 Cranston Rd. then right 7.0 miles on Rt. 377 (Cranston Road), then left 2.7 miles on Rt. 799 (Rock Fork Road). Barn is at left in a field some distance from the road, just before the junction with Island Fork Rd. Notes: Pattern was among several improved nine-patch designs suggested by the Anderson family. Final design and colors were chosen by the FQT Committee. The barn is on the farm where Waltz, KY was once located. 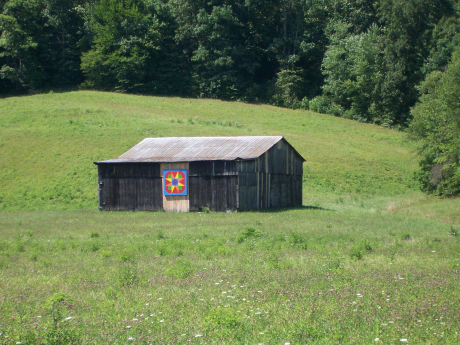 A post office and general store was run by the great-grandparents of the Quilt Square sponsor.